Rhubarb Chocolate?! Despite being cultivated for millennia, it's taken until now to put rhubarb into a chocolate bar - and our ancestors' loss is our gain! The finessed flavour of this fine fruit is a firm favourite amongst our team - they appreciate the lingering delight on the palate. Once you've tried it, it's hard to stop - we recommend buying this bar two at a time! 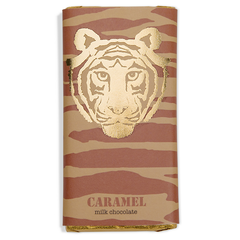 Browse more Paper Tiger Chocolate Bars.